T-H Marine Supplies, Inc., of Huntsville, Alabama, announces the acquisition of the assets of Blue Water LED Enterprises, LLC (Blue Water) of Lawrenceburg, Kentucky. Financial terms of the deal were not disclosed. Blue Water designs, assembles, and sells a broad and unique line of LED light kits and lighting components for boats, kayaks, autos/trucks, trailers, ATVs/UTVs, golf carts, RVs, off-road vehicles, public safety vehicles, and utility trucks. Blue Water has long been known as the pioneer and market leader in LED light kits for bass boats and professional bass fishermen. “It’s been an awesome experience to grow our company and to meet so many of our customers and dealers," stated Jeff Hillard, one of the original founders and president of Blue Water LED. "Our faith-based company has operated on the principles of providing superior-quality products, excellent customer service, and an unprecedented lifetime warranty." Huntley also said, “T-H Marine is known as an industry leader in supplying LED lights to the boat manufacturers. 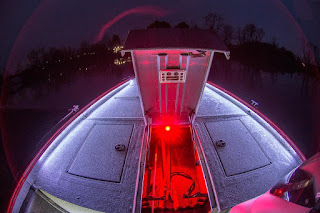 But Blue Water was THE visionary in creating easy-to-buy, easy-to-understand, and easy-to-install LED Light Kits for the aftermarket customer to add to their boats and for dealers to install in boats." Huntley said that the Blue Water assets are being moved to T-H Marine headquarters in Huntsville, Alabama, where future assembly and shipping of the product will occur. There will be no disruption to Blue Water customers or suppliers, just more access to the products through more places than ever. Blue Water LED products will be up and running as a T-H Marine brand in a matter of days. “Quality brands and products like Blue Water are what we seek to add to our strong portfolio of brands," Huntley continued. "This is our fifth acquisition in the past five years along with many product license acquisitions. We love being known as the go-to company for launching and acquiring innovative brands and products."